When you stay at Cortijo Las Piñas in Tarifa, you'll be near the bay, within a 5-minute drive of Ensenada de Valdevaqueros and Playa Valdevaqueros. Featured amenities include multilingual staff, luggage storage, and coffee/tea in a common area. Free self parking is available onsite. When you stay at RVhotels Apartamentos Els Salats in Torroella de Montgri, you'll be near the beach and 9 minutes by foot from Estarit Beach. With a stay at Viviendas Margarita in Colonia Sant Jordi, you'll be near the beach, within a 15-minute drive of Es Trenc Beach and Centro de Visitantes Ses Salines. 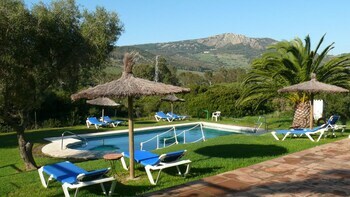 Located in Benissa, this villa is within a 15-minute drive of l'Andrago Beach and L'Ampolla Beach.